The Malian army says it is investigating allegations that soldiers have carried out summary executions in the Islamist-controlled north. A senior military officer told the BBC it was neither confirming nor denying such acts had taken place. The International Federation for Human Rights (FIDH) has accused Malian troops of killing Arabs and ethnic Tuaregs. In a separate development, one of the main groups fighting in northern Mali said it had split and wanted dialogue. The Islamic Movement for Azawad (IMA) announced on Thursday that it was breaking away from the main group, Ansar Dine, and "rejected all forms of extremism and terrorism". According to the statement, the faction is headed by Alghabass Ag Intalla, an important Ansar Dine leader and influential figure in Kidal. It said the group was made up entirely of Malians, who wanted a peaceful resolution to the crisis. The Malian army initially rejected the allegations of soldiers summarily killing people as "completely false". But on Thursday, an unnamed senior officer in Mopti - one of the areas where the executions are alleged to have taken place - told the BBC's Mark Doyle that an investigation team was looking into the claims. Some of the alleged executions were carried out in the Mopti area, a town which is strategically vital because it has a large military airport nearby, one of only a few in Mali capable of taking large transport planes. 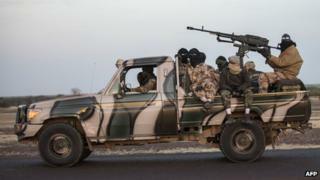 Reports have suggested that mainly Malian troops, drawn largely from the south, are targeting Arab and ethnic Tuareg civilians in frontline towns. The Paris-based FIDH has called for an independent investigation into the alleged abuses and said that those responsible should be punished. In the garrison town of Sevare, at least seven people were executed at a military camp, near a bus station and a hospital, the organisation said. There was "credible information" pointing to 20 other executions in Sevare, with bodies "buried hastily, notably in wells". Some of the victims were accused of possessing weapons, and of being "infiltrators" and "accomplices" of the militants, the FIDH said. Others were killed because they did not have identity documents or simply because of their ethnicity, it added. The killings expose a racial aspect to the war in Mali, which has been hidden by the emphasis on western troops fighting a war against Islamist insurgents, our correspondent says. France intervened militarily on 11 January to halt a militant advance. It said al-Qaeda linked Islamists - some of whom were foreigners - threatened to turn Mali into a "terrorist state". It has bombed suspected rebel positions and deployed about 2,000 troops to help the weak Malian army recapture territory. The United Nations refugee agency said 7,100 civilians had fled to neighbouring countries since 10 January to escape fighting.